Wesley surprised me today with a copy of Johnathan Blow's The Witness for the PS4. I'd heard a little about it about the internets. The only description I read mentioned exploring an island, which is apt but about as vague as possible. 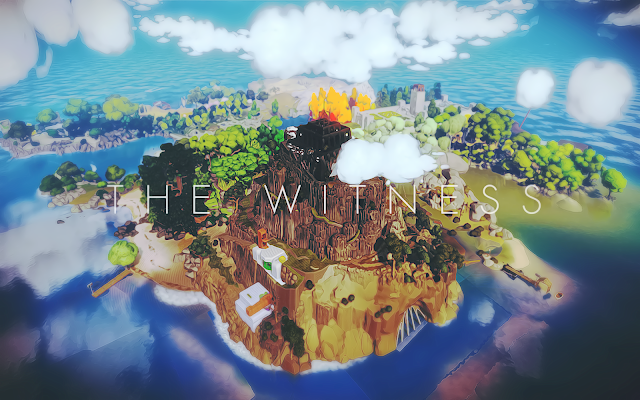 I'm perplexed by The Witness. I expected something like Dear Esther, but so far it is more like a mix of Myst and The Room. Some dismiss the puzzles in the game to be mere mazes, but I'd argue such a description is far too narrow. 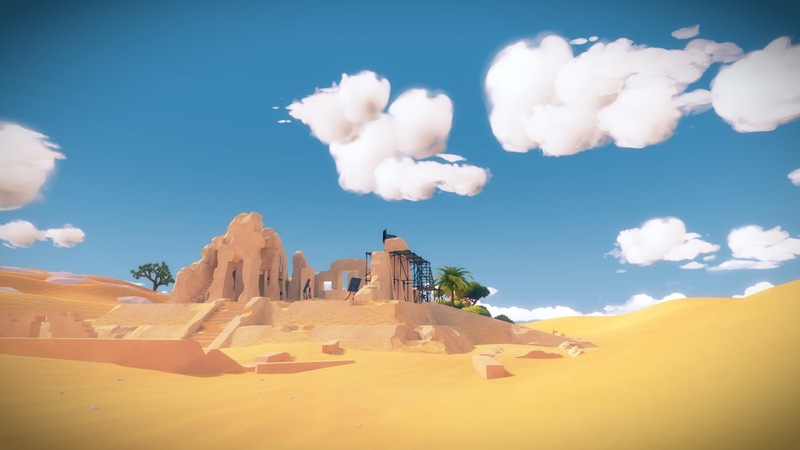 The Witness doesn't explain anything to the player. Your environment, captivating and beautiful as it is, isn't contextualized in any readily recognizable form. I discovered puzzles as I wandered about the island, each one more insidious than the last. Some of the puzzles give the player some sort of environmental clue to the solution while others do nothing of the sort (I think) I've been thoroughly stumped by a number of puzzles. A desert ruin. I know it is important, but so far I have no idea why. While the puzzles are undoubtedly captivating, the visuals are what really keep me exploring the expansive game world. The lush, bright color of the grass and trees, the detail and minutiae are astounding. The perfect, mirror like water doubles formations into great statures of praying giants, beautiful trees display vibrant greens, reds and purples . It's fast becoming a favorite game if for nothing more than the relaxing environment it provides. The puzzles have presented themselves -so far- in largely the same way; through screens connected through cables to the next element in the sequence. Because I can activate the drawing cursor at any time, I'm tempted to believe that there are puzzles hidden elsewhere though I've yet to encounter them. I've already become a little paranoid, looking at every vase, rock pile and weird looking cloud thinking it was part of some great puzzle in the sky. I've vowed not to use any walkthroughs, and Blow says he expects most player to spend close to 80 hours solving all of them, so I expect to be here awhile. One of the first puzzle sequences I encountered, set in an orchard. 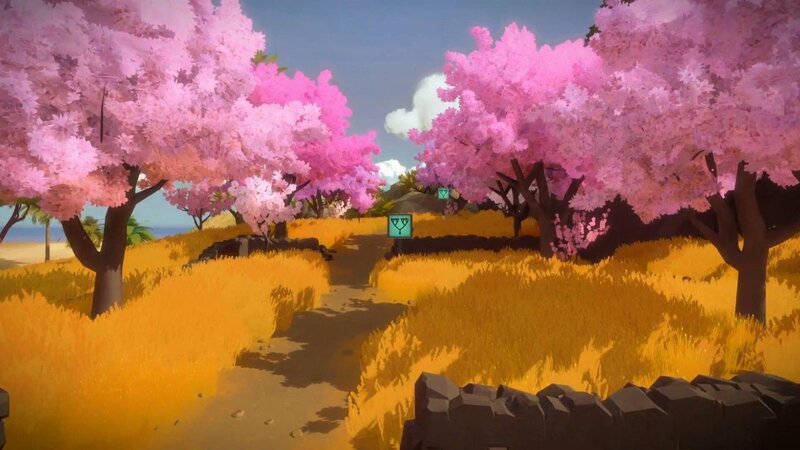 While i have really enjoyed what I've played so far, I really don't know what to say about The Witness yet. The puzzles are a ton of frustrating fun, but I haven't played enough of them to say how much depth they really have, nor can I comment on the overall structure of the game. As such, please consider this a provisional review. I know that over the coming days I'll be spending a lot more time in The Witness and I doubt this will be the only time I write about it.